After landing at midnight in the sleeping Colombo and damping down my excitement at having landed on Sri Lankan soil, we went straight to bed and awoke the next morning to the happy sunshine and gorgeous lagoon on which the hotel was located. We found smiley welcoming people and efficient friendly service. With an amazing cup of local Ceylon tea (yes, apparently tea can be amazing! ), we were off to a great start as we hit the road. Our trip began in Galle, on the southwest coast of Sri Lanka. We arrived by float plane from Colombo (bucket list item, check! ), which took us over the beautiful emerald landscape of lush hills and valleys of the interior of the province and landed us on the lovely Kogalla Lake nearby the city. Galle is home to the old Dutch Fort established in 1663 and thanks to these fortifications the old town was mostly protected from the devastation of the tsunami in 2004. It is like a little piece of colonial heaven within the confines of the fort walls. Outside the fort walls are the turquoise waters of the Laccadive Sea and the small but buzzing new town. Galle Fort is filled with pretty little boutique shops open to the steamy outside air, the weathered walls of colonial architecture and cozy restaurants and boutique hotels boasting an interesting history. There is a cool, relaxed vibe in Galle. It’s a great place to stroll around and stop to sip a cocktail while watching the sunset over the clear blue ocean. Heading east we explored herb gardens, a tea plantation and temples before finding ourselves at Mirissa for our morning on the ocean in search of the immense, but shy Blue Whale. We were lucky and spotted some reasonably quickly. A Bryde’s whale, a pod of dolphins, some flying fish and a mating sea turtle couple also made an appearance. It was a good morning out with one of a few reputable companies who respects international guidelines for approaching the whales. We stayed at a hotel right on the seaside away from the touristy Mirissa beach and, though there were several other buildings on the same stretch of sand, we rarely saw a soul away from the accommodation. 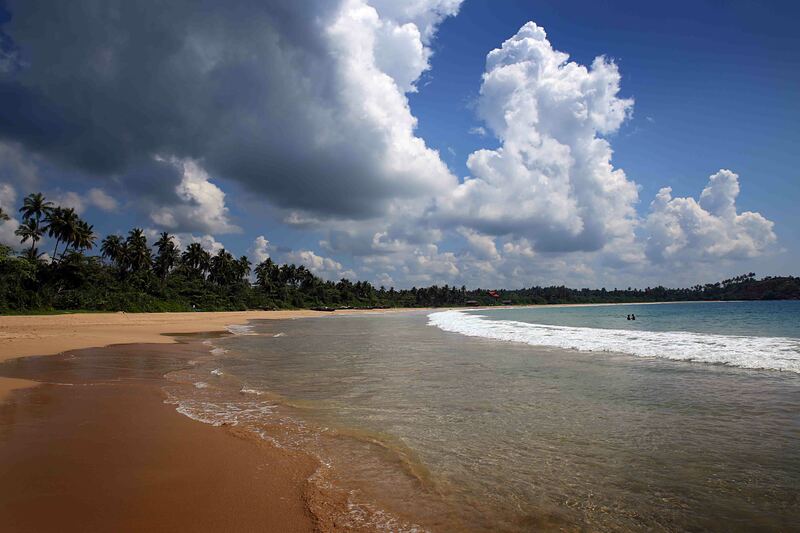 There are vast expanses of completely uninhabited beach all along the coastline in Sri Lanka. The water is warm and welcoming, with teal blue waves lapping at the shore. It is postcard stuff! It is common for travellers to hire a car and driver for their journey in Sri Lanka. The guide book suggests this because the driving is quite frightening, though in comparison to other countries we’ve experienced in the region, I would say that’s debatable. Regardless, it’s nice to be able to sit back and relax and be driven about by someone who knows the territory. The scenery changes drastically from idyllic lonely sandy beaches along the coastline, to the vibrancy of the many green-hued tea plantations, national parks and farming landscapes inland, though it would be difficult to decide which is more beautiful. For a small island, Sri Lanka is park-rich – 14% of its landmass is allotted to the Department of Wildlife Conservation. Our experience was at Uda Walawe National Park, a peaceful wildlife sanctuary which is known for its wild elephant population and birdlife. We arrived just as the rains had begun, at which time many of the elephants are less reliant on the main watering holes and move further into the park and away from tourist eyes. We did, however, manage to see several small herds of elephants with a few young ones under their protection. As a group they graze unobtrusively on the park’s greenery and, given their size, seem barely to disturb their quiet surroundings. 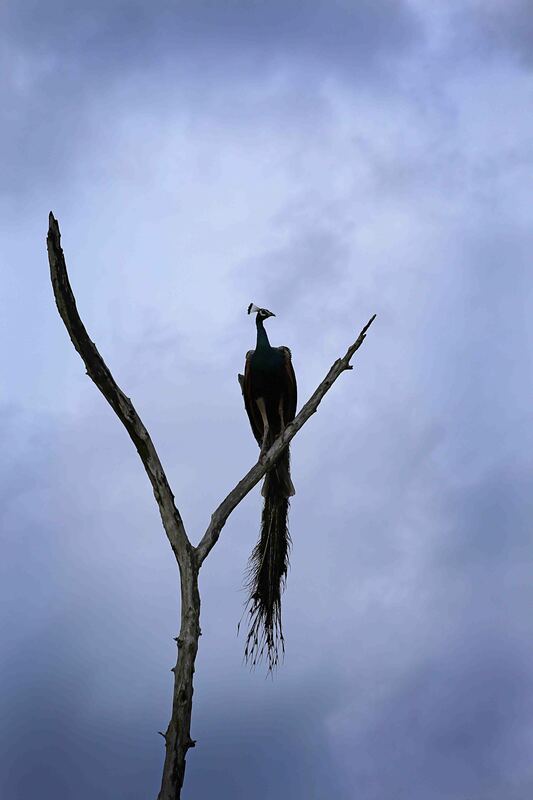 The birdlife is incredible in the park, including an abundance of peacocks who could be found in the trees out of the way of their predators while their feathers were drying from the rains. They would fill the air with the sound of their disappointment at getting their feathers wet. The peacock’s jewel colours remind me so much of the vibrant hues of the whole of Sri Lanka – the azure and turquoise blues of the ocean and the rich, emerald greens of the inland hills. From Uda Walawe, our driver delivered us to Ella after several hours on good winding roads. There seemed to be surprises at every turn on our car journey, like a quick detour along a meandering road flanked by small lakes covered in blooming water lillies. 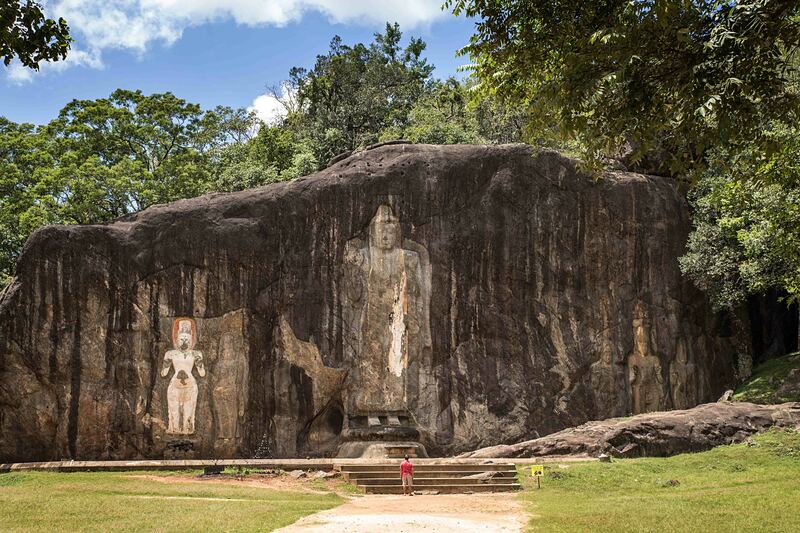 At the road’s end, the vast Buddha images carved into an immense rock wall were revealed at Buduruwagala temple. Once a quiet town, but now gaining in tourism popularity, hilly Ella is home to several tea plantations and the well known Little Adam’s Peak. After a gentle hike through one of these tea plantations and up the peak, we found views through the beautiful Ella Gap all the way to the coastline from which we had just come. Smiling tea-pickers in their brightly coloured saris line the track on their breaks from their grueling work. We drove through stunning landscape all throughout our Sri Lankan journey, but nothing compared to the views we saw from the train from Ella to Kandy. 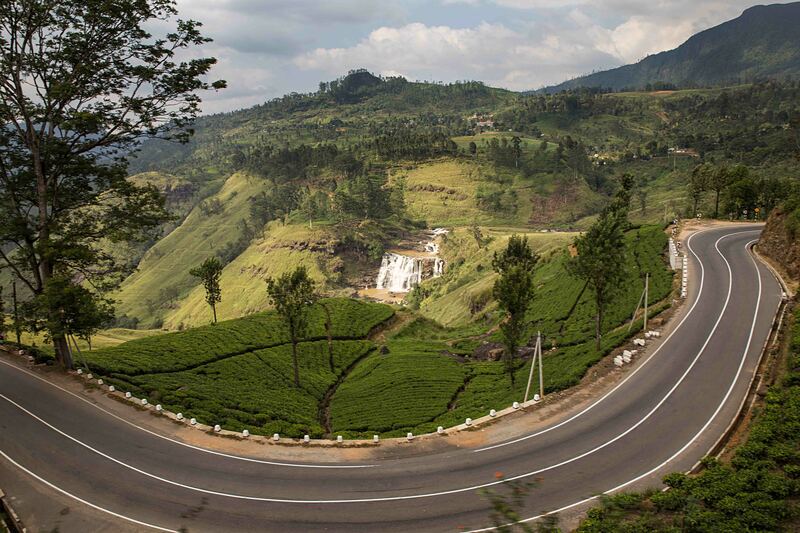 We slipped past train stations with names like Nuwara Eliya and Pattipola, some of the highest elevations in the country, making it ideal tea planting territory and favourite locations for the British tea colonials escaping the heat. The scene from the train window is streaked with rich green tones. It didn’t get old even after a 6 hour journey. It is breathtaking! We didn’t linger long in Kandy, but we did take some time to explore the impressive and popular Temple of the Sacred Tooth Relic and its surrounding grounds. The temple was congested with locals leaving floral offerings for the Buddha and awaiting the Sacred Tooth chamber to be opened. Our morning at the temple was filled with the ceremonial drum beats of a cluster of traditional drummers striking through the quiet scene as the Buddha in the downstairs chamber was prepared for his ritual washing. Arriving again in Colombo, we had come full circle on our Sri Lankan trip. Our brief stay here was accidentally timed with Poya (full moon) Day. 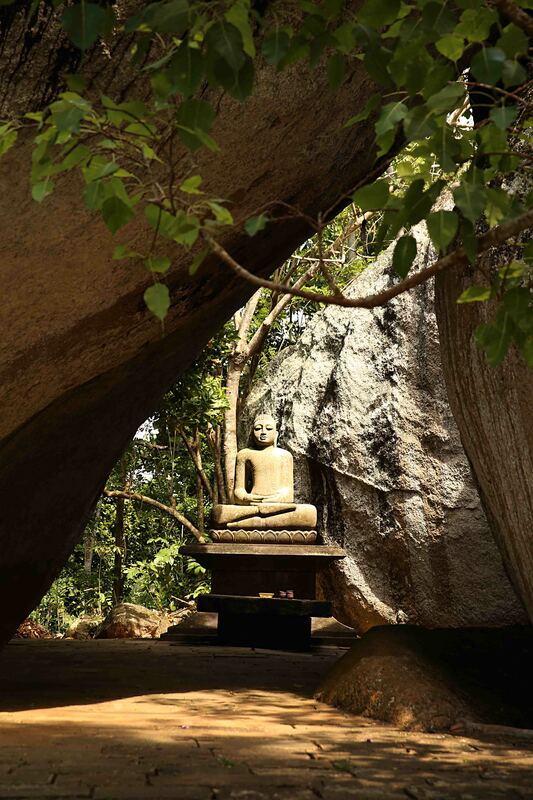 Poya Day is a monthly Buddhist national holiday, so most shops and restaurants are closed aside from a few catering to tourists, as many of the locals head to the temples to spend their day in meditation. Because it was a holiday, locals were also out in force on Galle Face Green, a big open grassy area facing the ocean and adjacent to one of Colombo’s most famous hotels, the Galle Face Hotel. Kites were flying, people were playing in the waves, vendors were selling deep fried snacks and music was blasting from 1980’s-style boom boxes. It was a great vibe and a great way to end our stay. Despite the incredible adversity with which the Sri Lankan people have been faced in their recent history – a 26 year civil war and the major impact along most of the island’s 380 degree coastline of the 2004 tsunami – they are seemingly happy and rightfully so. It is a beautiful place with so much to offer (including vast amounts of amazing tea!). We were completely taken by this vibrant country and its friendly people and as we left early the next morning, I found myself sad to be leaving. That is definitely the sign of a good holiday. Definitely try arrack (liquor distilled from coconut) while in Sri Lanka. The stuff we had was like good whiskey! As noted, the tea is fantastic in Sri Lanka. If you find yourself in Ella, try the iced tea at Chill Restaurant. Delicious! Be prepared for delicious but repetitive food across the country. Most of the local dishes don’t vary much anywhere you travel. The Sri Lankan’s are very serious about any considered disrespect to the Buddha. Always ask if you can photograph at temples and never pose with a Buddha image. Take the train from Ella to Kandy rather than the reverse route. This direction is far less congested and seats more readily available. Malaria is all but eradicated in Sri Lanka, though there are mosquitos and some sand flies. Bring bug spray with you as it’s apparently not easy to find in country. English is widely spoke on the island making it very easy to communicate. Stay at the Galle Face Hotel in Colombo. It is an old beauty with fantastic service and a delicious breakfast. Go now! There are some big hotels being constructed in Colombo and it appears tourism is on the rise quickly. Not surprising, but go soon if you want to avoid the inevitable masses.